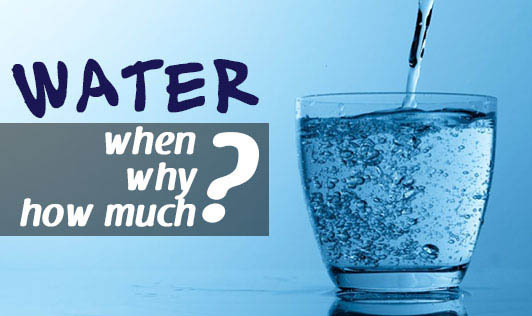 Water - when, why and how much? Water is a commodity that we take for granted. Yet we do not know so many things about water. For instance, a person is estimated to drink about 40,000 litres of water in his/her lifetime! Amazed? When do we need water? Most definitely, when we are thirsty. Water has to be taken through out the day. Though there is some controversy about taking water before or during or after meals, there is no conclusive evidence to show that taking water at these times would cause harm. There is a possibility of the digestive enzymes getting diluted by taking water before or during or after meals. Fortunately, Indian cuisine usually has some gravy dishes in every meal and satisfies the requirement for water during meals. If one takes a dry meal with no gravy dishes, then water requirement increases. This is usually indicated by thirst. Why do we need water? Water is required for digestion of food and elimination of waste products, lubrication for joints and eyes, regulation of body temperature, dilution of urine to prevent kidney stones and infections, to build tissues and so on. Water is vital for our existence. How much water do we need? Generally an individual has to consume 1.5 - 2 litres of water a day, but many fail to do so! Though mild thirst is a good indicator of water requirement, many of us do not pay attention to subtle body signals. Therefore it becomes important to keep count of how much water we drink in a day. A quick way to find out if you drink adequate water - watch the color of your urine. Pale or almost colorless means your water intake is adequate. Yellow color means you need to drink more water! A quick formula to know how much water you need per day - 30 ml of water for every kg that you weigh. If you weigh 60 kgs, you need around 1800 ml of water per day. We need more water when we exercise. Gravy dishes like dal tadka, rasam, sambar, vegetable gravies, buttermilk, raita, soup, etc have water content in them that is useful. Alcohol and caffeinated drinks are not counted in the total amount of water intake per day because these beverages have a diuretic effect - that is they remove water from the body by increasing urinary output.